Why take a safari in Kafue National Park? 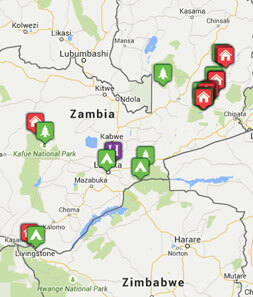 Kafue is Zambia’s largest national park, and is roughly the size of Wales. It tends to attract people coming to Zambia for the second time, who want to see a different region with fewer visitors and great diversity of both wildlife and landscape. The Busanga Swamp and Plains in the north are an amazing giant wetland. 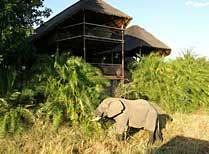 It is generally accepted as the best wildlife area in Kafue. Red lechwe and sitatunga antelopes are seen here, as well as diverse other wildlife. In the dry season the Busanga Plains are reminiscent of the Serengeti, and cheetahs and other predators love this area as the buffalo and other big game passes through. Hot air ballooning is available in the Busanga concession from August to October. Kafue is a superb birding area where you could see wattled cranes, Pel’s fishing owl, African finfoot and Denham’s bustard amongst roughly 400+ species. The open grassland of the Nanzhila Plains in the south are loved by elephants, buffalo, zebra and wildebeest, though it can be harder wildlife viewing here than in the north. You can enjoy boat safaris on the Kafue River. Night drives are permitted in the park. 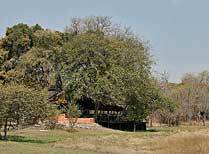 In general the best time to come to most of Kafue is in the dry season from around May/June to October. Up in the north in the Busanga region it can still be quite wet early in the dry season, so travel can be more difficult here until late June/early July. The Busanga Plains are flooded when the Busanga Swamps, fed by the Lufupa River (a tributary of the Kafue), overspill to the Plains. This leaves the Busanga Plains very wet until about early-July. For this reason the Plains are best visited from about mid-July to the end of October. If hot air ballooning is something you want to experience, this is limited to August to October in Busanga. A Kafue Safari: How to do it? You can fly from Lusaka in the high season from July to October three times a week. It takes 1 hr 15 mins to the airstrip in the central area. 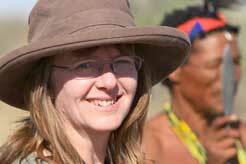 Charters from this airstrip to more outlying camps north and south are available. 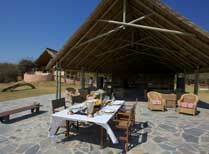 If you’re staying in the Wilderness Safaris Camps in Kafue you can also fly in from Livingstone. You can also drive from Lusaka to Kafue. It is a very good road all the way, indeed this main road bisects the park. It takes about 5 hours to get to the central area of the park from Lusaka. 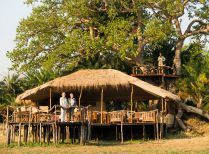 Kafue makes a good addition to other Zambian reserves such as South Luangwa or Lower Zambezi, and of course can combine with Livingstone too so you can see Victoria Falls. 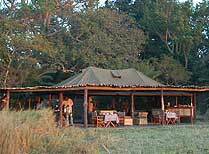 There are relatively few camps and lodges in Kafue but most of them are good quality. 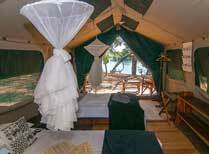 The central area camps include: Mayukuyuku Camp, Mukambi Safari Lodge and Mukambi Fig Tree Camp. In the south there is Kaingu Camp, Konkamoya Camp and Nanzhila Plains. 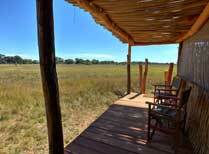 In the north, Musekese camp and Leopard Lodge are south of the Lufupa airstrip. 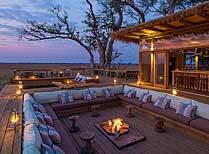 In Busanga in the far north are two camps belonging to Wilderness Safaris, Busanga Plains Camp and Shumba Camp, plus Mukambi Plains Camp. Flights from Europe to Lusaka take about 10 hours. Lusaka International Airport is about 25km from the city centre (about 30 minutes transfer). Visas are required for most nationalities, although a waiver can normally be organized in advance for British citizens. This is a malarial country.